“The stars at night are big and bright …” Learn more about one of Texas’ best natural resources – the night sky. 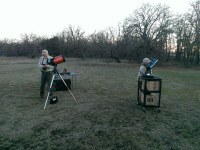 Observe stars, planets and constellation through the park telescopes! Learn about constellations and basic astronomy! This is a come and go event. Come by any time between 8:30 pm and 10:30 pm!